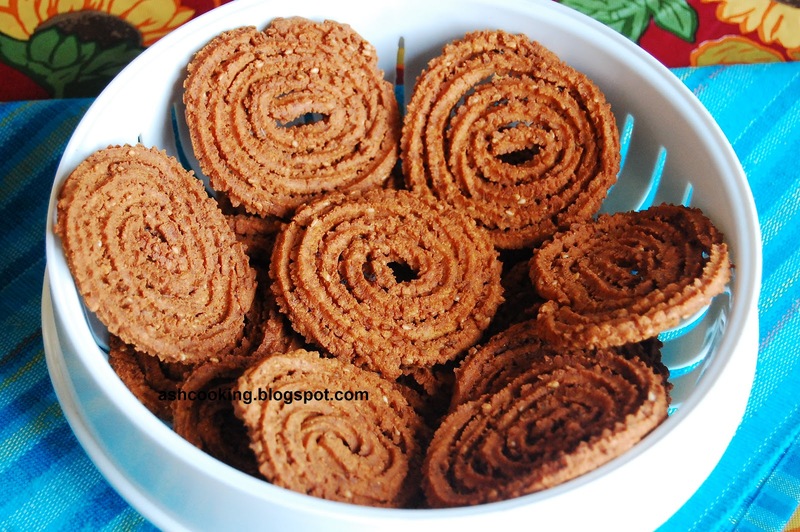 Murukku also known as Chakali is originally a South Indian snack of bewitching flavour in spirals, ribbons made from rice flour, urad dal flour, moong dal flour and water, seasoned with an array of spices. 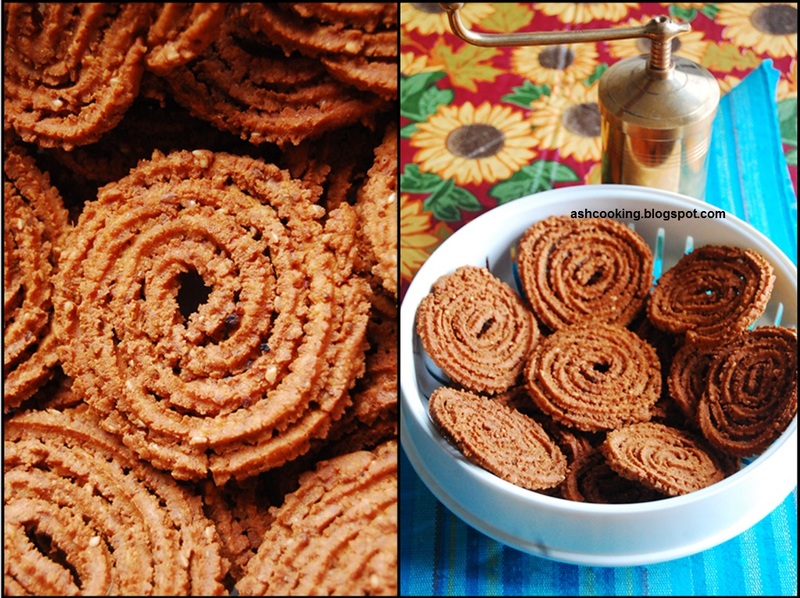 Murukku available in diverse flavours - Sweet Murukku, Garlic Murukku, Spicy Murukku and the like is sold in all corners of India as a traditional treat to be savoured during festivals like Diwali and Janmashtami. In Kolkata, Murukku is available in a selection of grocery stores round the year. We would buy the packets in bulk and stash them away in air-tight jars, serving them with tea when guests showed up unannounced. In Bangalore too, Murukku served the same purpose in addition to satisfying those untimely hunger pinches that rises especially when you are catching a movie on television at night. To prepare Murukku, one item cannot be dispensed with - the mold. It has a number of attachments like the ones that come with icing tube. I have used the star attachment to obtain the desired spiral shape. You may use ribbon or any other single attachment to acquire the desired effect. Ingredients: Cooking time: 1 1/2 hr approx. 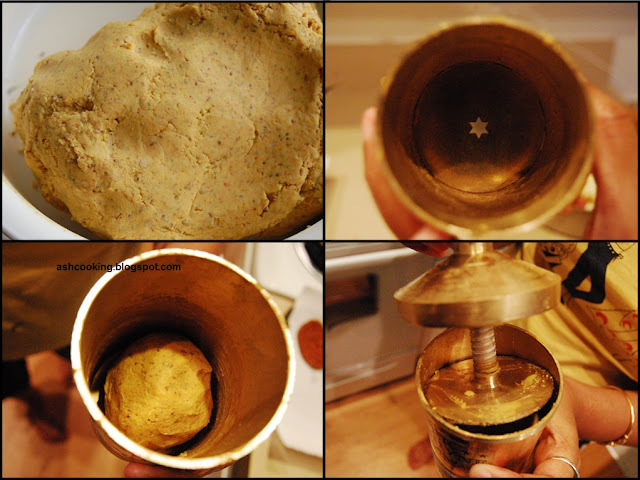 1) Heat 5 tsp oil and grind cumin seeds and ajwain together into rough powder using a blender. 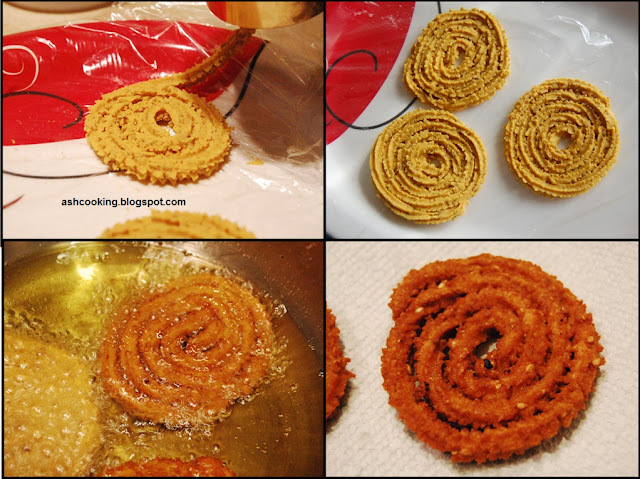 2) Combine rice flour, gram flour, cumin and ajwain powder, turmeric powder, dry red chilli powder, sesame seeds and salt. Make a well in between using your index finger and pour the oil in. Fold it well into the flour. Add water and knead dough, similar to chapati dough in consistency. 3) Wrap the dough in plastic wrap and keep aside for 30 minutes. 6) Store the murukkus in an air-tight container at room temperature. They remain good for a long time.